The purpose of this research is to identify the key driving forces that have an impact on educational technologies to find out the effects of these drivers on each other and the system. This research is a special attention to driving forces which seem they are able to change the educational space paradigms. This study explored the identification of medium term investment opportunities in the field of educational technology. It also helps to plan for the creation and development of new educational institutions and equip universities and schools based on future needs. In this regard, after the identification of effective driving forces, the relationships between these drivers were determined by the experts including university professors, leading educational college managers, and product developers in the field of educational technology and then the results of cross-impact analysis were analyzed by Mick Mac software. Finally, the drivers of virtual learning and learning space as strategic drivers in this space were identified and the factors of reinforcement and system verification indicators were presented. Despite the long educational technologies life, there is a question that determined these technologies until today the education model or orientation? Although these tools before the advent of digital interactive tools have widespread developments in terms of the applied technologies in them, but they perhaps have not special developments in their nature and instrumental identity (Hiltz and Turoff 2005). A man stood in opposite of his friend near the cave’s wall and painted forms on the wall in order to transfer the concepts to him. The other man wrote the given points on the walls for reminding or educating others and his children. Years later, teachers spoke with chalk and board with learners and books printed in beautiful and diverse sheets of paper. Now, the wall of the cave or the board of classroom has been transformed to the LCD monitors or virtual images, and books are printed in electronic form, but the nature of book or board or teacher presentation has not undergone significant changes for learners. In other words, everyone is thinking about improving the tools for common teaching methods, not the tools that change education. This leads to inattention or less attention to this field. But it seems that new technologies are emerging of a kind that can change significantly the education space paradigm. (Hiltz and Turoff 2005). Although in the case of not-accepting this claim, even by sound probability, this change will force planners and policy-makers to pay attention to it. This research is a special attention to driving forces which seem they are able to change the educational space paradigms. By advancing the technology and reaching the technology to its peak of flourishing, various transformations have begun in the business world which indicates a new period in learning science and profession by humans (Mitra 2003). Although we are not at the beginning of way. While digital revolution in education technologies, even if they are dating back to the Internet, will not last up to 30 years, therefore there are only some apertures of what is going to happen is seen, but we can see future opportunities from these apertures correctly and draw a correct path for today. (Kaplan and Haenlein 2016) Interdisciplinary courses which are increasing day by day, jobs which need a combination of artistic and technical expertise, professions like computer science and internet which convert to the minimum tools for knowledge learning, like writing and reading, and transfer the education to the first years of life (Emadzadeh 2002), informal education policies versus formal education which encounter higher educational participation of adults (Kalenda 2014), the role of web facilities in the basic research (Ronan 2015), gradual coordination of digital and real world (Beeler 2015), all and all indicate perhaps a new period in the scientific life of humans and their used educational technologies which is very different from the past. The approaches developed by new information technology and communication in the education, including metacognition, process-oriented learning and independent learning processes lead to the gradual movement in redefinition of basic concepts of education. Science, teaching, teacher, student, content and school are gaining new definitions. Globalization has eliminated in most cases the traditional borders between education and technologies and these borders needs redefinition (Saboori khosroshahi 2010). In these rapid changes, selecting outdated technologies, without considering the national and regional conditions, not only makes no profit in the education, but also its importance in losing the economic and business opportunities is important. Many articles have posited the importance of this course, but less attention has been paid to practical strategies. This research tries to start the way in order to find technology opportunities window along with new characteristics of education environment. Correct application of rapid transformations in science and technology and management of scientific and technology transformations requires us to design science and technology policies corresponding with future threats and opportunities which are the product of science and technology evolutions. There is no doubt that the future threats and opportunities should be predicted with suitable methods and foresight methods and the more these methods become reliable, the results of future studies will have higher importance (Farad development foundation 2013) (Bayat et al. 2013). Identifying which educational technologies will emerge in the future generation and spread widely, gives this possibility to us to become active against these technologies and far before that we force to use coercive actions in encountering new technologies, we select the technologies) Lee and Malerba 2017) which can be domesticated and develop benefits in encountering national and cultural conditions in a systematic way (Ridgman 1996). What are the important and effective key driving forces of future educational technologies? What are the effects of these key driving forces on each other and their priority based on the influence on the whole system? Now it is understood that if development and reforms are needed, it should be started from education and the approaches developed by the new communication and technology period in education including metacognition view, process-oriented learning and independent learning have caused the gradual movement in redefinition of basic concepts of education. Knowledge, teaching, teacher, student, content and school are gaining new definitions. Globalizations has eliminated the traditional borders between education and technologies and needs redefinition. For example, eliminating the border between national governments and global society, national culture and its constituents subcultures, school and local community, home and school, education and work, work environment and learning institutions, formal and informal education, predetermined curriculum and choices of people, student and teacher, parents and children, and even between different fields, has caused major challenges in the education that planners and teachers should take immediate and courageous steps for reorganizing education in all aspects and dimensions in order to encounter and adapt with changes (Saboori khosroshahi 2010). The literature review shows this fact that the education system has gone the wrong way until the middle of twentieth century and there is a wide gap between education and life. The gap between life realities and school educations has caused problems, defeats and troublesome frustrations, such that students were far from what happened outside the school and make them aligned with external events and changes. Despite the past, today and tomorrow education means a continuous process of learning by each human. One of the new goals of education is learning to change. Obtaining knowledge, nurturing the intelligence, talent, and self-recognition and becoming aware from personal gifts and talents, using creative and imaginative intellectual powers, overcoming the undesired and destructive motivations, playing responsible roles and etc. are some goals of new education (Schneider and Bertrand 1990). Information technology has gradually become a part of educational institutions’ curriculum and this is done in order to develop the education quality with less costs and higher quality education using the Internet. This policy-making caused the widespread communication of students throughout the world. In this communication, the quality of education systems will be compared in the global level (Mehralizadeh 2004). Currently, formal education of the country relies on the memorization and this trend continues for each student for 12 years; therefore, most education presented in this period is subjective versus objective. The separation between subjective and objective and the lack of contact between theoretical educations with experiences and realities, have no results except the alienation of students from the active outside world. Human beings would like to conjecture and forecast the future. Perhaps we can say that this is as old as human life. But in the second-half of the twentieth century, forecasting activities was done in a scientific, systematic and regular way in the technology and social problems by both US and Japan and other countries and the future study knowledge has developed since two decades before based on these experiences and information (Karimifard 2010) (Malekifar et.al. 2006). Various definitions have been presented for fore-sighting up to now but perhaps the following definitions is one of the best given definitions: foresighting is a systematic attempt for looking the long-term future in the knowledge, technology, economy, environment and society which is done in order to identify the emerging technologies and determine those parts in which investment has higher social and economic profitability (Farad development foundation 2013). Four important features of modern world are instability, uncertainty, ambiguity and complexity. In the chaotic world, decision-making and action are the most difficult works (Zavari 2013). During previous 50 years, by the emergence of strategic thinking, gradually countries, global organizations and large and small firms pay attention to the future studies as a ground for strategic planning such that future studies have become an integral part of each research dealing with macro, important and strategic topic (Abasnia and Abdi 2013). Trend analysis is exploiting date for diagnosing and detecting environmental and attitude changes about the future situations. In other words, trend analysis is studying a certain trend in order to discover the nature, causes of emergence, development rate and its potential consequences in future (Slaughter 2013). Mega trend is a widespread trend of a major effect or a combination of sub-trends which can create major effects Dave et al. (2007). Mega trends are global factors which form the basic conditions in all economic aspects and society for time interval of 10 to 20 years Winterhoff et al. (2009). In this applied research, a quantitative-qualitative method called structural analysis was used in order to find out the effects of these drivers on each other and determine its impact on the education system. Structural analysis method is one of the methods which deal with the analysis of relationships between variables and different parts of a system and its output applies for studying the relationship between variables and identifying their features. This method, by combining with environmental monitoring method, can have numerous applications in the understanding of the future dimensions of a system and interactions of variables in future (Rabani 2012). The statistical population of this study was selected among experts, professors, pioneers in technology development fields, pioneer educational institutions’ management, and scientific-research experts, especially experts in new technologies field. Snowball sampling method was used and due to the limited population, the sample size was as large as available statistical population. In structural analysis, the Mic Mac software measured the data validity in the indicators obtained after data evaluation. The matrix with two rotations had %100 suitability and optimality which indicates high validity of questionnaire and its responses. Mic Mac software was used for data analysis in this research. Mic Mac software has been designed for conducting complex calculation of cross-effects matrix. The relationship between variables measures by numbers between 0 and 3. Lack of 0 means lack of effect, one is weak effect, 2 is the average effect and 3 is a high effect. Therefore, if the number of identified variables (n) changes, a n*n matrix obtains for the relationships between variables (Zali 2010). The obtained method can be displayed with its corresponding diagram in which the effect direction on each variable is shown by arrows and amount of effect with figures on the top of arrows. Finally, based on the topology of these variables, this software can extract and rank key factors (Godet 1991). The software analyzes the relationships among variables in all steps and outputs in two major forms. In the first case, it analyzed the direct influence of variables on each other which is called matrix of direct influences (MDI) and in the second case, it considers the indirect influences Fig. 1 of variables on each other; for example, if variable A influences the variable B and the variable B influences the variable C, we can measure the influence of variable A on variable C. This is matrix of indirect influences. For analyzing the results, at the first step, with a simple method we can find that the effect of variables can be measured by considering the number if relational groups in the formed matrix. The variable which has direct influence on the limited number of variables will have little influence on the whole system. Therefore, the direct influence of one variable can be studied by considering the related column in the matrix. Therefore, in Fig. 2, which is a representation of a simple matrix of direct influences, the total number of each row indicates the influence of related variable, and the sum of numbers in each column indicates the influence of the related variable. 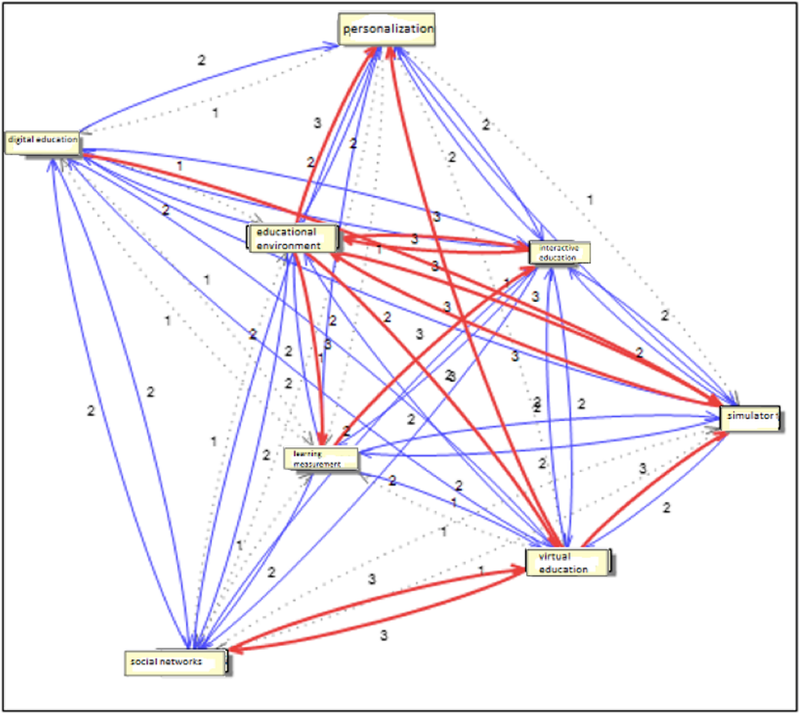 Therefore, all variables and their encompassing environment can be shown in a conceptual diagram with influence-influencing diagram (Zali 2010). The statistical population of this study was selected among experts in technology development fields, pioneer educational institutions’ management, educational complexes technology management and scientific-research experts. As seen in Table 1, among respondents, 22 were male and 5 were female. 20 respondents had higher education degrees: 6 subjects with doctoral degree, 14 with M.A and 7 with B.A. descriptive statistics of respondents and identified driving forces and their definitions are mentioned in Tables 2 and 3. -Education does not indicate the skills of people and grades provide very ambiguous information about the tacit knowledge of people. Objective knowledge, skills and professional experiences need a method for validation (Adams Becker et al. 2017). -measurement or learning analysis: measuring, collecting, analyzing and reporting data are related to the learner and their problems which are done to understand and optimize the environment and learning process. This is the analysis of frequency data about the students for evaluating the academic advancement, optimizing the future performance and highlighting the strengths (Harmelen and Workman 2012). -Increasing the facilities of schools for using the Internet, tablet, E-Book reader and laptop which provides independent learning for learners. -BYOT which is an abbreviated form for bringing your own technology means that the students should have different devices with themselves which have educational consequences for them (previously, schools tried to provide these devices for students) (Digital technology trends 2016). -Libraries convert to the open learning environment with widespread capabilities for rest, creativity and computers (Moesha 2016). - An effective trend which occur currently by using computer software and the Internet is flexibility in the education. Students are able to use the best training content provided by the best coaches, at any time and in any place they want. (Collis and Moonen 2002). -Development of social networks is one of the major trends in the information technology field. Social networks display an effective and complex information society. With an accurate look, the society is a combination of various networks like inter-organizational networks, intra-organizational networks, personal networks, computer networks and transnational networks from which information flows. Social networks are not the only new technology tools which provide considerable facilities for the Internet users. Social networks can be considered as a new mean which have changed the social, cultural, economic and political structures. The increasing expansion of social networks has caused this issue to become one of the most important national security problems of countries (IT & management issues, 2011). -Statistics show that currently 90% of students in America use social networks and these networks are used as a communication tool between students, professors and principals (Davis 2001). -Information and communication technology can provide personal and smarter equipment, tools and services and gives this possibility to users to have more control on their data. Therefore, users can meet their needs directly. In fact, by development and advancements in the information and communication technology and related tools with customization of these systems, they can use it in wide range. For example, some applications and information systems provided the possibility for definition and changing the information entities and workflow for final users without intervention of software engineers. -Changing the role of teacher to facilitator of learning is one of the serious trends in the educational space. Schools at the era of mobile phones are moving from memorization to wisdom based on skills. This is not about what you know, this is about how do you know it and the planning for what is necessary to know. By providing deeper questions for students and rapid access to data, teachers can focus their efforts on the persuading children to become curious and innovator (Moesha 2016). -Interactive learning along with education with conceptual questions have more effective results on students’ learning (Redish 2003). -Out mathematics curriculum is based on arithmetic and algebra. And what we learn after it, is in the same direction i.e. differential and integration. We placed our course pyramid on the differential and integration, while we should place it on the statistics. Statistics is predicting the trends and future. The world has changed from analog world to digital world and now is the time to change mathematics from analog to digital, continuous and classic mathematics to discrete and modern mathematics, uncertainty mathematics, randomness mathematics and this is probabilities and statistics. In the complex world instead of learning calculus techniques, it is more important that our students know what is meant by standard deviation from mean (Benjamin 2009). -Gamification, augmented reality, three-dimensional printers, flight simulators, surgery simulators and etc. with augmented reality facilitate education for learners. After this step which confirmed the driving forces gathered by library studies and expert opinions and displayed the importance and priority of these driving forces, structural analysis table provided for experts and effects of these driving forces on each other evaluated. Here, we entered 8 driving forces as variables to matrices which created a 8*8 matrix and completed by experts and final results presented in Table 4. This data revised to enter into the Mic Mac software and presented for analysis. Among 64 relationships evaluated in this software, 8 relationships are zero which means variables did not change and the rate of filling matrix is %87 which indicates the higher relationship of variables with each other and significance of the test. This also shows that the factors have large and scattered effects on each other which is a sign of system instability. Table 5 shows that matrix with two rotations has 100% suitability and optimization which indicates high validity of the questionnaire and its responses. Based on matrix, direct and indirect effects of data in Table 6 can be obtained which indicates the influencing and influence of each variable. Table 6 presents two important parameters. The first parameter is the influence rate of each variable on other variables which is the sum of the rows for each variable in the matrix. The second parameter is the rate each variable being influenced by other variables which is the sum of column for each variable in the matrix. Variables which have the highest influence in the system are variables which should be considered and the basis for evolutionary movement of the system in future depends on these variables, but if these variables have considerable influence, the possibility of investing on them and giving direction to the movement of the system and if the influence of these variables remain low, although their effects on the system is definite, yet there is no possibility for control and intervention in the system movement for actors. The more the variables with high influencing and being influenced in the system, the lower the stability of the system and there is possibility for influencing the system by actors. This is in contrary with the state in which variables with high impacts are less influenced and actors are not able to influence the system and the path of system is determined. Each variable is placed in the diagram based on the rate of influencing and being influenced. 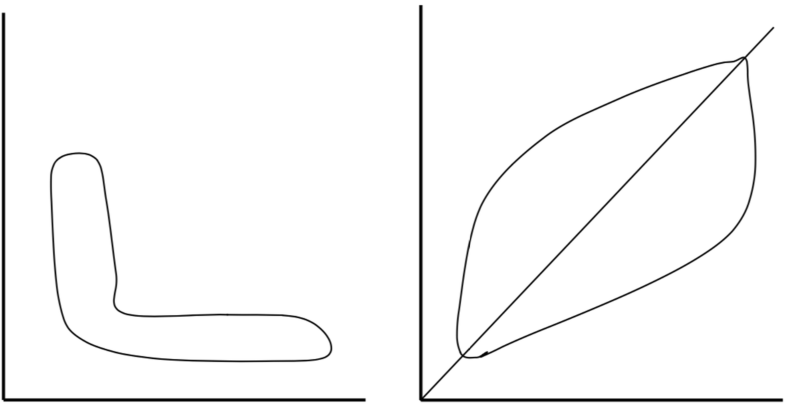 The position of variables in the diagram which is shown in Fig. 3, indicates their position in the system and their role in the dynamics and transformations of system in future. The dispersion of the variables in the diagram indicates the stability and instability of system. As seen in Fig. 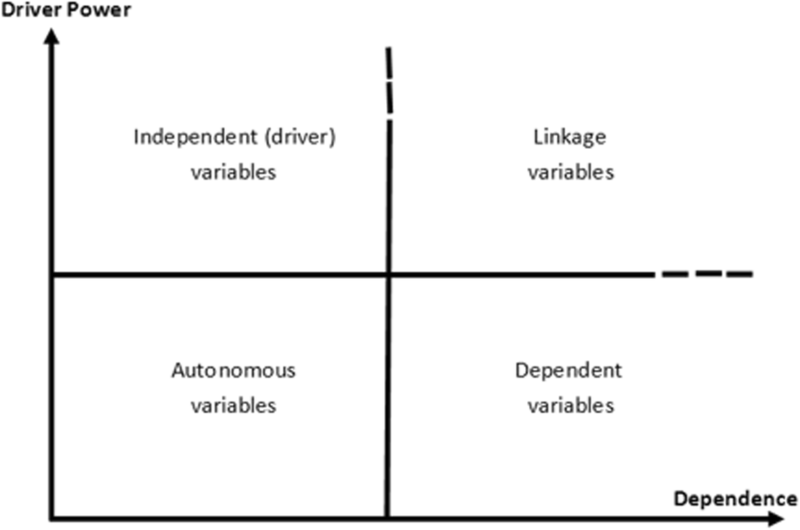 4, if variables are in L form in the diagram, the system is stable and this indicates the stability of the system in the influencing variables and their continuous influence on other variables. If variables disperse from the origin of coordinate to the right side of the diagram, the system is instable and the lack of influencing variables threatens the system (Rabani 2012). 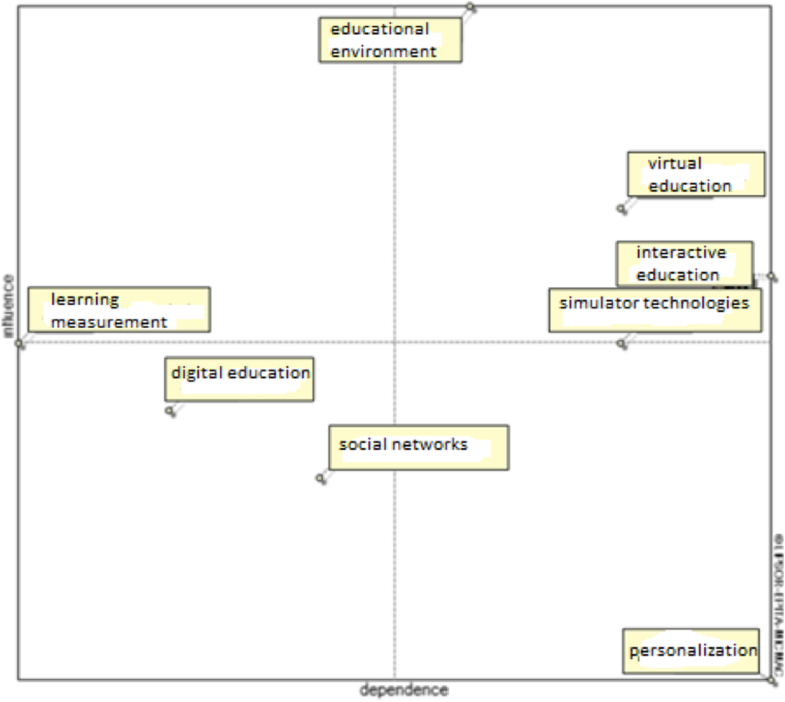 The variables of educational environment, massive open online education, and interactive education and simulator technologies are all classified in two-dimensional and risk variables. These variables simultaneously act as influencing and being influenced. The nature of these variables is combined with instability because every action and change on them has reaction and change on other variables. These results and reactions have boomerang effect which finally intensifies or dampens the primary effect and sign. Among these variables, educational environment and massive open online education are classified as risk variables. This means that these variables have a very high capacity for becoming key actors in the system, because their instable nature can completely influence the system. In fact, high influence of these variables provides this possibility that whole system moves in the given direction through them. On the other hand, interactive education and simulator technology variables can be considered as objective variables because these variables are being more influenced instead of influencing and they can be identified as the results of system evolution with acceptable certainty. In other words, these variables are the goals which can be achieved in the case of moving system in the right path. Personalization variable is a dependent variable. Dependent variables have low influencing and are highly influenced. Therefore, they are very sensitive to the evolution of influencing and two-dimensional variables. Digital education and social network variables are among independent variables. This means that these variables are not influenced by other variables and have no influence on them and they have low relationship with system, because they neither stop a main variable nor develop a variable in the system. As seen in the diagram, these variables are not near to origin and in other words, they are not in discrete independent variables group. This means that these variables are related with dynamics and changes of the system and they cannot be excluded from the system. Social network variable, as is evident in the diagram, is located in the center of the diagram and can act as the “secondary level”, “weak objective” or “secondary risk” variables. Results of analyzing system stability and instability also show that instability governs the system. In fact, the higher the concentration on the influencing and influenced variables, it is natural that the more stable is the system and the higher 3-dimensional and lever variables, the higher is the instability of the system because the intensity of the changes and influence of variables on each other is high. Results indicate that focus is on the diagonal line passing the origin and the system is highly instable. One of the significant outputs of the Mic Mac software is the graph of driving forces influence on each other. This graph, as seen in Fig. 5, indicates the effects of these driving forces on other driving forces and their weakness and strength. In this graph, red lines indicate strong influences, bold blue lines indicate relatively strong influences, blue lines indicate moderate influences, and black lines are weak influences and dash lines are very weak influences. Another output of the mic mac software is the study of indirect influences. Matrix of indirect influences (MII) is a matrix corresponding with matrix of direct influences which is enhanced by consecutive iterations. Here, the user can define number of iterations required for the system stability. The software shows the number of required iterations for achieving stability by default. 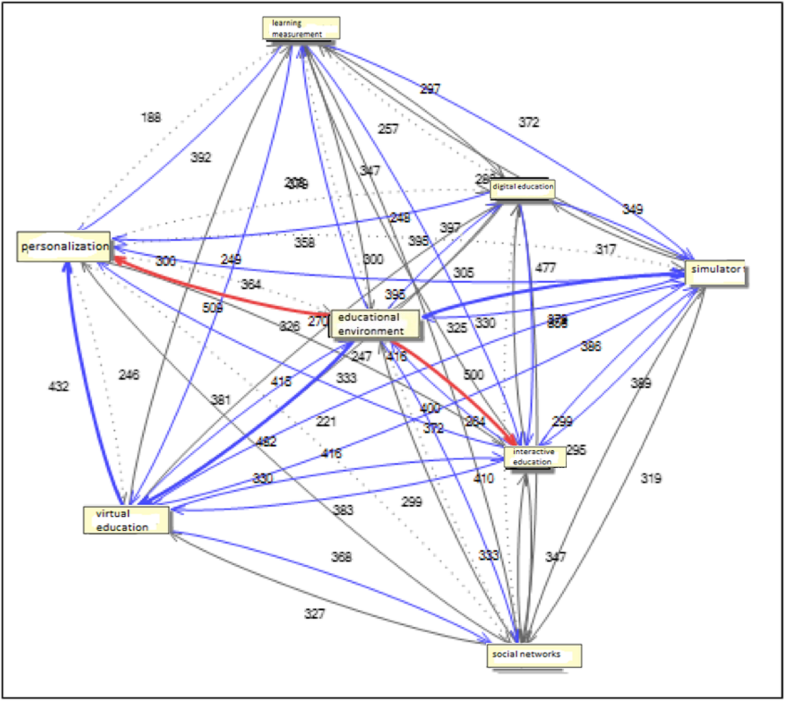 As seen in the graph of indirect influences in Fig. 6, it is clear that the educational environment is important and strategic. High and widespread influence of this variable on other variables has made this variable as the key and special variable in the system. Widespread effects of virtual education on the personalization and interactive education, simulator technologies and social networks is justifiable. The influence of measurement, educational environment and interactive education on this variable also shows the influence of this variable. The basic idea of this article was from widespread views of scholars on the massive changes in the educational process. The opinions of those who believe that the new educational technologies will change the nature of the training. (e.g., Mitra 2003; Ronan 2015; Kaplan and Haenlein 2016). The results of the research confirmed this issue very well and confirmed extensive studies on the influence of virtual education and other new technology among the learners, such as Horizon reports in Iran. Foresighting studies in Iran have not so far focused on education future topic, but there have also been some valuable actions. For example, Farasatkhah (2013) has introduced a university foresighting conceptual model. Also, in 2015, he has reported factors that shaping the future of science in Iran. His study did not pay attention to the technology trends and educational tools. In 2014, the Future Studies Desk will be established at the Institute of Research and Planning in Higher Education. Montazer and Falahati (2015) examined the effects of information technology in higher education, which was also widely acknowledged as a result of this study on the widespread impact of information technology on education. Uncertainty of collectivism or individualism in education, which Montazer was not fully consensual, in this study - with regards to confirmation of interactive teaching - promotes collectivism. Among the considerable points in the analysis of results is that influencing variable which are less influenced and cannot be controlled but highly influence the system, are low and with weak influence. In other words, there were no variables close to the zero point. This indicates that despite the primary presumption that this system is influenced by the technology developments, it is highly influenced by the policies of the policy-makers and influencers in this fields. None of the identified driving forces were diagnosed as without influence by the experts and this is confirmation of reliability of the obtained results in the driving force section. Strategic variables of virtual education, educational environment, and interactive education and simulator technologies have interaction with each other. Among them, the effect of educational environment on the virtual education, personalization, simulator technologies, educational measurement and interactive learning is highly significant. The importance of developing a pioneer educational space is evident in this research. Currently, there is some research for changing educational movement, such as providing virtual education by large universities and private institutions which provide creative and attractive services for children to fill their leisure time and other events, but what is clear from the results of this research, is the importance of developing pioneer educational environments. About educational environment, we should pay attention that although they have considerable facilities in terms of tools, but the culture imposed to these tools is more important and this culture has the major effect on the learners. For example, although it is assumed that Maraghe observatory is a place for observing the stars and planets, but in fact, this observatory became a place for gathering scholars and scientists in Iran, such that common sciences like medicine, philosophy, jurisprudence and etc. taught in this place and various scientists did research in it. About the effects of social networks on the virtual education, we can say that these networks develop a ground for interaction of learners and their participation in the classroom and provide more efficient educational suggestions. The effects of educational environment on the virtual education is that in the new educational environment, the emphasis in on the open education and based on the needs of learners. In this case, the major thing that enable students in this regard, is the virtual educations in all its types which both answers the educational needs of students without time and place limitation and facilitates the communication between different educational institutions with learners. The influence of educational environment on the virtual education is more serious than the impact of virtual education on the educational environments. This is a proof for previous claims that pioneer educational environment solves many problems in the educational system. In the current educational environments in which one-way classrooms are dominant, learners have not any reason to use virtual education content. Unfortunately, we should say that virtual education is currently a false education which should not be taken mistake with future generations of virtual education. Recently, this possibility that those students who failed to enter into valid universities use the virtual education for achieving the scientific degrees, has developed a disruptive and false environment in which many students are inclined to use these types of education. This is while new generations of virtual education cannot meet this need of the users; instead, they are intended to provide the possibility of academic excellence for learners without limiting then in the common stereotypes of educational institutions. Regarding the importance of this driving force, we should think how we can develop the opportunities by enhancing this driving force. Results of structural analysis are useful in this field. This driving force is highly influenced by interactive education and simulator technologies. Interactive education has great influence on the educational environment. In fact, the nature of interactive education has a move toward pioneer educational environment based on the personal devices. Based on the diagrams and graphs of interaction, the second important variable in this system is virtual education. Virtual education has direct and strong influence on the personalization of education process. In personalizing the education process, the learner seeks to receive education corresponding with individual needs in desired amounts in desired time and place. It is clear that virtual education can cover all these cases if it presented correctly. It is true that technologies like simulator technologies or social networks are complex tools which provide higher competencies for learners, but they are not influential as virtual education in middle-term regarding the influence on the learners and educational system. One of the controversies about the results of this research is the responses of subjects to the questions which have developed primary mindsets about them, but their nature and influence range are not well understand. What experts consider as virtual education, if it exceeds the virtual educations presented by domestic universities and reports about them, is like educations provided in the pioneer institutions. This should be mentioned that expert opinions about this field is different and contradicted inside the country and abroad. If we look at the first graph, we see that other relationships of virtual education are considerable like its effect on digital education. The influence of virtual education on digital education is due to the fact that the expansion of virtual education and combination of virtual education with simulator technologies meets the need of learners for memorized materials. For example, when sending the barcode image of a tablet shows all its features and side-effects and use points to the doctor, the need to widespread education before starting activity is somehow unreasonable. Another example is when a geologist obtains information with scanning the photo of a stone, including its type, age, material and other required data. One of the major problems of virtual education in the one-way platform of these educations which reduces in most cases the role of teacher to an educational video. This problem solved in a new platform which improve by using social network capabilities and machine learning and provide active participation opportunity in the classroom, receiving suitable education and efficient educational suggestions. In order to develop this driving force, we can use graphs. As seen in this graph, this driving force is highly influenced by the educational environment and social networks. In a new educational environment, the emphasis is on the open education based on the needs of learners. In this case, the major tool which enables the learner is various types of virtual educations which answers the educational needs of learners without time and place limitation and provides the possibility of communication between educational institutions with learners. About the effect of social networks on the virtual education, we should say that these networks develop a ground for interaction of learners with each other and their participation in the classroom with more efficient educational suggestion using artificial intelligence. Now it is clear that opportunity window which will be open for us in the educational technology is influenced by which driving forces with which strengths and weakness and solution. This indicates that planners and policy-makers in the educational systems principals, economic activists in educational technology and other actors who are intended to use the business opportunities, should focus their attention on which driving forces and although other driving forces were influential in this field, but the intensity of their influence was so low that investment on them and paying attention was futile. Currently, there is no special happening in the educational technologies throughout the world and although some new technologies have emerged in this market, but they were not converted to the driving forces for changing field and developing new paradigms of market. Yet, by widespread developments in the technology field, it seems that educational technologies can change the rules and this is the reason behind this research. Results of this research indicate that if we are going to develop new opportunities in the educational technology, what its direction is and activists should focus on which variables. It is very useful if researchers study the results of this research and analyze the results with fore-sighting methods like writing scenario, key driving forces like virtual education, interactive education, environmental education and even social networks and draw the scenarios for these driving forces to indicate the transparency and clearness of these opportunity windows and their influences and exploitation methods. Thanks to everyone who has contributed to the collection and analysis of the data as experts. The dataset upon which the conclusion of this manuscript rely will be made publicly available via additional supporting files that can be provided upon request. The main idea of the article also the method of research and the main structure of the manuscript of the first author, and the collection of data and analysis of them was also the final writing by the second author. Both authors read and approved the final manuscript. I confirm that I have read Springer Open’s guidance on competing interests and I declare that none of the authors have any competing interests in the manuscript. Abasnia, S. & Abdi, M. (2013). Foresighing of knowledge-intensivecompanies’ management in Iran. 2004. First national foresighting conference. Yadegar Derakhshan Arya corporate. https://www.civilica.com/Paper-FUTURESSTUDIES01-FUTURESSTUDIES01_045.html. Beeler, J. (2015). Toward an adult learning-based theory of K12 educator professional learning for technology adoption. North Carolina State University https://repository.lib.ncsu.edu/bitstream/handle/1840.16/10310/etd.pdf?sequence=2&isAllowed=y. Lee, K., & Malerba, F. (2017). Catch-up cycles and changes in industrial leadership: Windows of opportunity and responses of firms and countries in the evolution of sectoral systems. Research Policy, 46(2), 1–14 https://www.sciencedirect.com/science/article/abs/pii/S0048733316301408?via%3Dihub, https://doi.org/10.1016/j.respol.2016.09.006. Saboori khosroshahi, H. (2010). Education in the globalization era, challenges and solutions., 1, 196–153 http://sspp.iranjournals.ir/article_631.html.